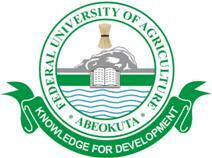 Federal University of Agriculture, Abeokuta, (FUNAAB) Postgraduate Diplomas, Masters and Doctor of Philosophy Degree Programmes Admission Form, Duration, Admission Requirements, Application Guidelines for 2018/2019 Academic Session. Postgraduate portal will open on Monday, December 17, 2018. Closing date for online Submission of Application for Masters and PGD programmes is Thursday, April 30th, 2019. Application for Ph.D. is open all year round. Successful applicants will be contacted by e-mail or telephone.